Finding a kitchen appliance that won’t leave a bad taste in your mouth can be difficult. 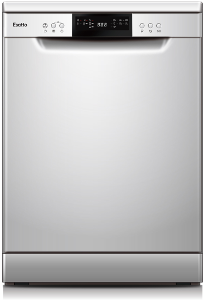 But for a dishwasher catered to suit your needs, Esatto has a number of options with stacks of features. Esatto’s dishwasher collection is described to help make washing up convenient, efficient and reliable. Some of the products include the Esatto 60cm Stainless Steel Freestanding Dishwasher and the Esatto 60cm Stainless Steel Freestanding Dishwasher with Cutlery Drawer. Other appliances from Esatto include fridges, multi-function ovens, gas cooktops, rangehoods, clothes dryers and washing machines, but in this review we’ll look at some of Esatto’s standout dishwashers. If you want a dishwasher to cater to your kitchen needs, the Esatto 60cm Stainless Steel Freestanding Dishwasher has a range of customisable features. Some of these include a removable cutlery basket, collapsible plate racks and height adjustable upper baskets. The ‘EDW7S’ also includes the Half Load function so you can wash smaller loads without needing to consume as much energy as a full load. A start option is similarly available if you need to start the wash cycle up to 30 minutes, 60 minutes or 90 minutes later. This standard model comes with 14 place settings, has a 4.5 WELS water rating and a three-star energy efficiency rating. Featuring a third cutlery drawer, the Esatto 60cm Stainless Steel Freestanding Dishwasher with Cutlery Drawer may be an ideal solution for people who tend to fumble around their dishwasher trying to figure out where to load their knives and forks. The ‘EDW7CS’ model also includes a start delay function for up to 24 hours as well as seven extra wash programs and settings, such as ‘pre-wash’, ‘heavy’ and Extra Dry. The Esatto 60cm Stainless Steel Freestanding Dishwasher with Cutlery Drawer contains 14 place settings, has a 3.5 star energy rating and a 4.5 WELS water rating. Should I buy an Esatto dishwasher? From gas cooktops to vented clothes dryers, Esatto has a broad selection of appliances for your home. With a tag line like ‘everything but the kitchen sink’, Esatto’s range of dishwashers is certainly packed with features claimed to help make washing up quick and easy. Features like the Half Load and Hour delay start could make these products ideal options for families and for busy households. While the models share similar functions, the main difference between these dishwashers is the additional cutlery drawer and extra wash options with the Esatto 60cm Stainless Steel Freestanding Dishwasher with Cutlery Drawer. This model also includes several programs like ‘glass’ and ‘heavy’, which are said to offer tailored options for a more efficient experience. But how does Esatto stack up to other brands like Miele and Asko? Check out Canstar Blue’s customer satisfaction ratings via the link below.